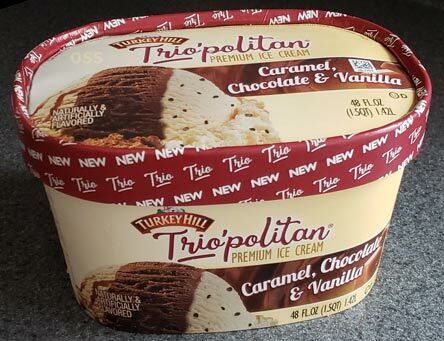 [New for 2019] It looks like Turkey Hill is literally doubling down on Trio'politan this year as we go from 4 Trio flavors to 8 (excluding the all natural version anyway). Will they have other new stuff for us? Maybe, but for now, we dig in to the first new Trio'politan flavor I could find. Nothing crazy here, just three fairly basic flavors all in the same container. 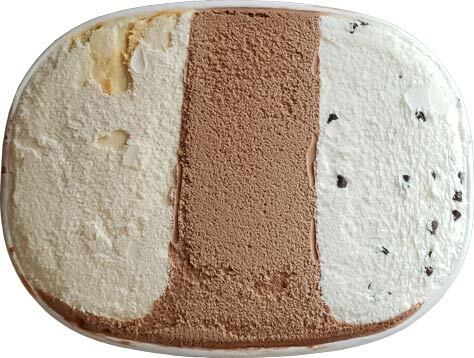 The vanilla side continues to use those annoying teeny tiny chocolate chips that we've found in other Trio flavors. Maybe it cuts down on clogs or something, but I find them pretty annoying. The caramel side is very potent. I know some people like strong caramel, but I prefer sweet caramel. It's not burnt or toffee, but it does lean that way. The chocolate is just chocolate, nothing else. Not a huge fan of it, I prefer their all natural stuff instead (not that it's perfect, but it's better!). Saying that, I also prefer their all natural chocolate chip flavor, so why would I buy this? It certainly won't be for the caramel. Let's mix all three together then to finish up... hmmm, yeah, that's something. Apparently I'm too old to understand this flavor or something. 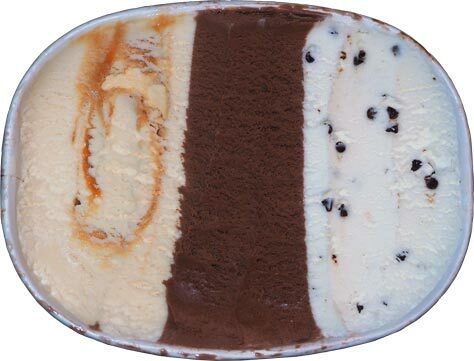 The ice cream is decent quality but I don't understand this particular match up. I'm guessing the new caramel machiatto flavor will bring more fun for the coffee lovers out there while the coffee cake flavor will bring the #funfactor. On Second Scoop: Ok, I was probably a little hard on this one yesterday. The secret is to scoop across the flavors instead of with them. Get some of each in every bite and just try to enjoy the variety. This is still a non-traditional caramel here, and I still hate the chips, but at least it's different right? --- I came home one day and my daughter goes "I like that new ice cream". I was surprised, but I think it's the variety that piqued her interest. I'd say the coffee cake flavor is the one I'm most intrigued about (though I'll probably try all four of these). I'm a cinnamon and graham cracker sucker (as well as brown sugar), and this one seems a little bit unique. I actually just scooped in to the coffee cake one yesterday, so that will be the next Trio posted. As to why some of the parts are plain, I have no idea.... simplicity? What are the other three new flavor combinations? I felt the SAME WAY about scooping across rather than individually. I did not care for the caramel on its own, but did enjoy it with the others.